"I am as lost and confused and alone as I have ever been. No, high school will never be a time I look back on fondly. My mom once old me that the world is divided into two kinds of people: the ones who love their high school years and the ones who spend the next decade recovering from them. What doesn't kill you makes you stronger, she said. But something did kill her, and I'm not stronger. So go figure; maybe there's a third kind of person: the ones who never recover from high school at all." "Certain facts tend to render everything else irrelevant." When you cry while reading the authors one-page note at the beginning of the book, you know you're in serious trouble. Julie Buxbaum is no newbie, she is a well-known and well-loved bestselling author of two contemporary fiction pieces that can be categorized as "women's fiction" - After You and The Opposite of Love (which are now on top of my TBR list - I already ordered both!). 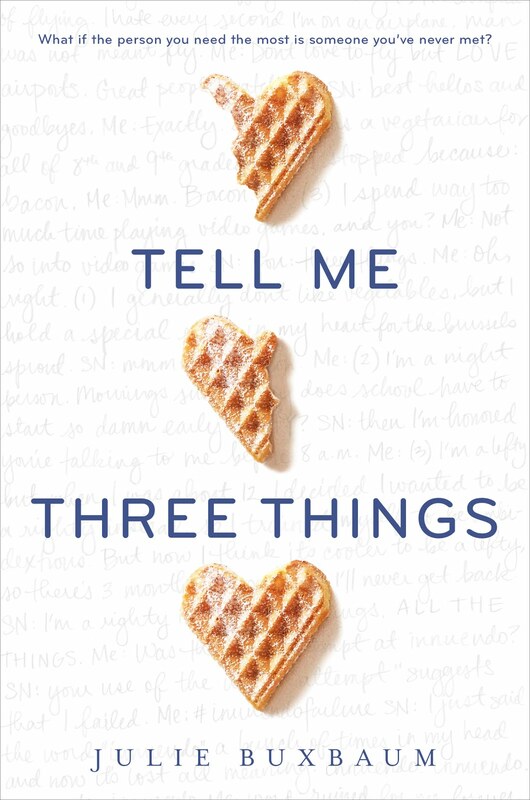 Tell Me Three Things is Julie's YA debut. It's not just another book to add to Julie's portfolio, either, but a story that a story that (at least to some degree) reflects her own thoughts and experiences, which made it so much harder for me to get through it. The emotional load is almost physically present and weighing heavy on your heart as you read about Jessie's (the protagonists) life and the things she is going through, how she is dealing (or trying to deal) with the fact that her mom died of cancer and her father remarried and uprooted whatever was left of their small family and moved them to LA. It's all so very hard for Jessie - the new school, new reality, strange house that doesn't feel at all like home, strange woman who is now a part of her dad's and her own life, being far away from her close friend - everything is extremely hard to deal with. But still, the hardest part of it all is not having a mom. The hardest part is watching your mom get sick and die. When you're only 14. When you love her and need her so much. The hardest part is knowing that she no longer exists and you are left here, without her, that you will never see her again, never hug her again, that you haven't yet asked her about so many things.. And the way Jessie describes this pain is profoundly affecting and moving. I can't even begin to imagine what it is like to lose your mom - no matter if you're a small baby or an older adult, I think it breaks your heart regardless and you can never prepare yourself for it. You can never be ready to lose your mom. My mom and I are very close and I miss her every day. We live oceans apart, but we talk every day and she is an absolutely essential part of my life. Just knowing that she is there and I can call her anytime to hear her voice, that I can see her every now and then, that eventually we will all be reunited here, in the USA, as a family, it's something that gives me strength and motivation to keep going, keep living and keep working. I can not imagine my life without her. And as I was reading about Jessie, her pain, loneliness and all of the things she was going through, I felt an ache in my heart. I felt so very sorry for this fictional character and all the people out there - especially kids and young adults - who have lost one or both of their parents, too. 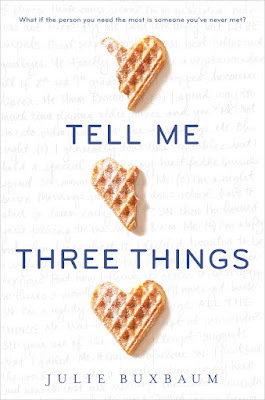 Julie Buxbaum wrote with such raw honesty, such incredible vulnerability and sensitivity, I couldn't help myself, I cried and cried while reading some of the more powerful and emotionally gutting passages. This book was not easy for me to read, and yet I gobbled it down. While loss is a big part of this story, the recovery, healing and opening up to another human being is also a very important chunk of it. This book is about grieving and hurting, but it's also about healing and learning to make peace with your past. It's also about friendship, love and finding comfort in others. It's just an all-around beautiful, wonderful and meaningful story that I believe everyone should read at least once. If you enjoy books such as All The Bright Places or The Perks of Being a Wallflower, you will most definitely love this book as well. And thank you Julie for this story, I will forever keep it close to my heart.